Except for the Southwest and extreme southern states, wintertime in the United States means at least some snowfall. Welcomed by children and winter sports enthusiasts, snow also means traffic problems and clearing sidewalks. Blizzards can bring everything to a standstill and cause loss of life and property. Snow formation has a lot in common with rain formation and begins with water droplets. These freeze into different forms of snow crystals depending on temperature and atmospheric conditions. Winter snowstorm conditions arise when a mass of warm, moist air rises from the Earth's surface into colder layers of the atmosphere. Several scenarios are possible: A warm, moist air mass can collide with a cold air mass, forcing the warm air above the cold air. Warm air can also cool by traveling up a mountain slope. A third mechanism is called "lake-effect snow," and occurs when cold, dry air moves over a lake and pushes warmer water vapor upward. The rising warmer air that contains water vapor forms a cloud. Clouds form when water vapor turns back into liquid water through condensation. For condensation to occur, a solid particle or surface is necessary. Think of dew forming on grass. Water droplets in the cooling air mass condense around tiny particles in the atmosphere, such as soot, pollen, dust or dirt. As the cloud containing water droplets rises into higher, cooler layers of the atmosphere, or as cooler air moves in to lower the temperature, water droplets freeze into ice and snow crystals form. Upper atmosphere temperatures where water droplets occur need to be cold for crystal formation. Ice crystals start to form once cloud temperatures reach about -10 degrees Celsius (14 degrees Fahrenheit) or lower. Individual snow crystals grow by colliding with each other to form larger symmetrical snow crystals, which fall when they become heavy. Air that is between 0 and 2 degrees Celsius (32 to 35 degrees Fahrenheit) usually brings the heaviest snowfalls. Crystals change their shape as they fall depending on the temperatures they encounter, but they keep a six-sided shape with identical arms because each arm encounters the same conditions. Ground temperature is also important to snow formation, with snow forming only when the ground is below 5 degrees Celsius (41 degrees Fahrenheit). Snow crystal shapes depend on temperature. From 0 to -4 degrees Celsius (32 to 25 degrees Fahrenheit), thin hexagonal plates form. Needles form from -4 to -6 degrees Celsius (25 to 21 degrees Fahrenheit), and hollow columns form at -6 to -10 degrees Celsius (21 to 14 degrees Fahrenheit). Sector plates resembling 6-petaled flowers result when temperatures are from -10 to -12 degrees Celsius (14 to 10 degrees Fahrenheit). Familiar six-armed dendrites occur from -12 to -16 degrees Celsius (10 to 3 degrees Fahrenheit). 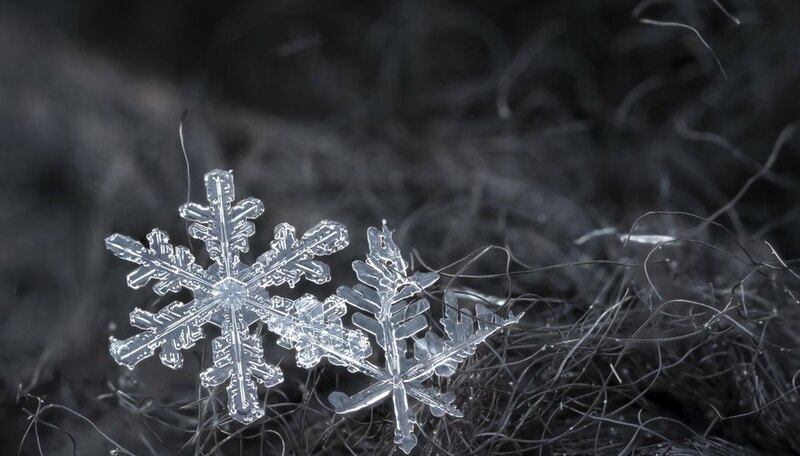 Many snow crystals can group together to form one snowflake. Most snowflakes are 1.3 cm or less in diameter (0.5 inches), but some large flakes are near 5 cm (2 inches) wide. MetOffice: How Is Snow Formed? Csanyi, Carolyn. "How Does Snow Form?" Sciencing, https://sciencing.com/snow-form-4563981.html. 25 April 2017.